More fun than a gallon of strawberries. - what wizardry is this!? svn supports symlinks? A dark Filesystem. In the middle, a Repository boiling. Thunder. 1 PROGRAMMER. Thrice the padded buf hath oe'r runn'd. 2 PROGRAMMER. Thrice and once, the platter spun. 3 PROGRAMMER. Hexate cries:—'tis time! 'tis time! Compile first i' the charmed pot! Cycles burn, and repo bubble. With Microsoft's new WinWord tool. Then the code can ship, hooray! I use Boost.Python to write some C++ extensions for Python. I work on an I/O-bound Python program; Python has a global interpreter lock ("the GIL") which means that in a multi-threaded program, only one thread can be executing code inside the Python interpreter at once. Now, a thread can drop the GIL, and the built-in Python read and write routines do this so that while one thread is doing I/O, another thread can run. However, due to a peculiarity in how the GIL is implemented,1 even though the actual I/O takes place during system calls that drop the GIL, the need to re-acquire the GIL after every I/O operation was killing our performance. That did get the I/O off of the main thread. However, while the write call in Logger.writeEntriesForever would make the logging thread drop the GIL, allowing the main thread to continue executing, the logging thread would need to reacquire the GIL when write returned. Now, it'd drop the GIL again when while waiting, which is where the thread would spend most of its time, but then it'd need to acquire the GIL again between the end of wait and the start of write. All of these context switches were almost completely negating any performance win from offloading the actual I/O to a separate thread. Enter Boost.Python. The GIL is only needed when using the Python interpreter, so if the entire body of writeEntriesForever doesn't need the interpreter, the thread can drop the GIL as soon as it enters that method and never reacquire it. This means writing that method in some language other than Python, which is what Boost.Python makes it easy to do. // and reacquired when it goes out of scope. ScopedGILRelease noGIL; //Drop GIL before acquiring mutex to avoid deadlock. So, that all worked fine and dandy until I did three things. The first thing that caused a problem is I also decided to move the code for interacting with Oracle into a Boost.Python extension. For the usual reasons, I didn't want to have that code and the logging code in one big honking library of doom, so I put it in its own extension; there was now logging.so and oracle.so. The second thing that caused a problem is that our logging code is actually more complicated above. We have a syslog-like framework where there are different categories of log message, and the app can be configured so that different categories have different log levels. There are a lot of LOG_DEBUG statements in the application, but if none of the logging categories are configured to be that verbose, those statements will never actually make it into the log. static std::map theLoggers; //Map logging destination to the logger object. static std::map theSettings; //Map logging category to its log level. It would compile, but it wouldn't run because the symbols from logging.so were unresolved. Okay, easy enough to fix. I added -l:logging.so to the link line for oracle.so and went about my merry business. This looked like it worked, but none of the messages from oracle.so were actually making it into the log! I thought I must be doing something threading-related incorrectly, or something. But, eventually, while debugging in GDB I noticed an odd message. 2 locations? Oh. Well, that was the problem. To load the dynamic library at runtime on Linux, Python uses the dlopen function. The documentation for dlopen mentions, in the description of the flag argument, that the RLD_LOCAL flag (the default) means that "symbols defined in this library are not made available to resolve references in subsequently loaded libraries." This meant that when Python loaded oracle.so, ld.so would map in a new copy of logging.so (because oracle.so was linked to it), ignore the copy pulled in when Python did dlopen("logging.so", RTLD_LOCAL); . This meant that when Python routines called logging functions, they got one copy of the static data, while when oracle routines called logging functions, they got their own copy of the static data! So, the database code wasn't seeing any of the logging settings changes made from the Python code. ###---*** If you don't, your import will fail with unresolved symbol errors. RTLD_GLOBAL is the opposite of RLTD_LOCAL, so now the extensions were able to see each other's symbols, and everything was happy. 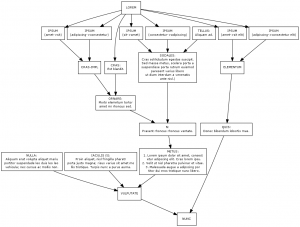 I was spending time trying to fine-tune a graphviz file documenting the call graph of a piece of code and describing some of the critical functions. graphviz isn't really designed for the kind of long node labels I wanted to give it, so it would do things like put nodes in places which made it have to draw arrows reaching clear across the page. Finally I realized that rather than trying to talk graphviz into reordering its nodes, I could just refactor the thing I was graphing so that the flow wasn't so darned convoluted in the first place. Who Would You Defriend For A Klondike Bar? Pretty clever marketing campaign: Defriend 10 people on Facebook, and get a coupon for a free Whopper. 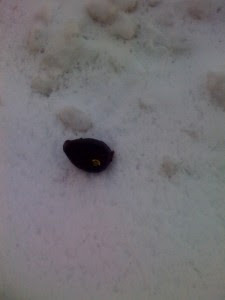 An avocado in the snow. Who left it there? I do not know. Allow you to feel special, great? You weep from terror, weep from woe? And rest, green flesh and tasty meat.